You’ve seen him out there, the solitary golfer. He is meticulous, as he can afford to be, playing by himself without the worries of group-mates urging him on. He walks at his own pace, takes his shots with care and effort, and is probably having the time of his life. I am a relatively new golfer, but I enjoy the weather and the friendship and the sneaky-beer drinking that goes along with shooting 18 holes. However, I have never been golfing alone. I have played basketball at the neighbourhood park alone, I have taken a soccer ball to the field alone. But golf? Even though it is perhaps the best sport for solo players, it always seems odd to be playing by oneself. But I wanted that experience, and, perhaps most importantly, I had the time. 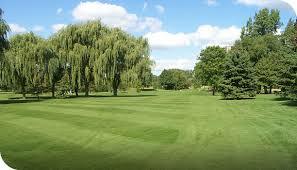 That is why, on a Monday evening, I ventured out to Scarlett Woods Golf Course for 18 holes of solitary golf. Just me, my clubs, my iPod, and the course. In part, I wanted to work on my golf game, work on my drive, narrow down my putts, etc. But I also wanted to see what I would think about, how I would pass the four hours, while challenging myself physically and mentally. I arrived early, warmed up with some putts on the practice green, and practically skipped over to the first tee full of confidence. My first drive off the tee was a low line drive, straight as an arrow, and landed neatly on the fairway. My golf-confidence (golf-idence?) was through the roof. My second shot, from about 120 yards away from the pin, rocketed to the right and ended up on an adjoining fairway. Golf-idence (I’m going with it!) level, zero. I picked up a scorecard on my way out of the club house. After a disgusting first hole (I shot a 7 on a par 4), I decided that score keeping could only make me frustrated and lead to a Charl Schwartzel-type rage, so I put the card in the bottom of my golf bag and forgot about it forever. My golf-idence level rose steadily through the first 6 holes. I was keeping my knees bent, my arms loose, my head down. I was making some good club choices, and to anyone watching from a distance, I might have looked like a guy who knew what he was doing. My iPod seemed to sense my mood, as it was giving me a lot of ‘Watch The Throne‘, the soundtrack to feeling good about yourself. Without warning, my fortunes did a 180 degree turn. Hole 7: 353 yards, dog-leg left. I slice my drives to the right. Not sometimes, not occasionally. I always slice right. This did not bode well. As I step into the tee box, ‘Things Ain’t Like They Used To Be‘ comes on, offering more than a hint of foreshadowing. As expected, my drive veers right instantly, hits a willow tree, and lands on the 11th fairway. Ok, at least I’m on a fairway. Better than being in the rough, behind a tree. Things can still be fixed. No need to be too sad about it. What do you think, iPod? That doesn’t bode well. I step up to the ball with my 5-iron, bend my knees, loosen my arms, keep my head down. I swing. And top the ball. It bounds about 15 feet forward and stops. Stay cool, Dagonas. Work through this hole, things will get better. I hack and chop my way to the green, then sink a 13-foot putt. This game makes no sense to me. Just when you couldn’t feel worse about your skills, golf gives you just a glimpse of hope. My mixed feelings continue to linger as I work my way around the turn and towards the tenth hole. I’m on the downhill slope of my golf experience, and I don’t just mean because I’m halfway done. My arm is sore, my golf game is weakening, everything is slicing right, even approach shots and putts. Hole 10: 111 yards, par 3. 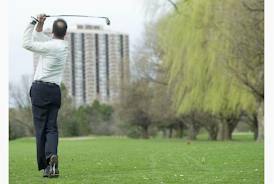 I pull out the nine-iron, take some gorgeous practice swings, then step up to the tee. My brain is throwing all sorts of instructions at me; If I’d never realized the definition of over-thinking, I definitely do now. “Head down! ARMS LOOSE!! SWING THROUGH!!! !” These vague instructions offer little advice or solace, but I step up and swing. A beautiful looping shot, straight as an arrow, lands about 15 feet from the hole. What the -? How did that happen? How can I bottle that, and use it for every shot? 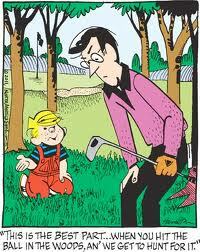 Therein lies the mystery of the game, especially for the novice golfer. My birdie putt missed, naturally, so I ended the hole with an impressive (for me) par. Hey, maybe things are looking up. Even the iPod agrees, by serenading me with Outkast’s “Hey Ya” as I strut to the next tee box. The 11th and 12th are par 4’s, so I sliced the hell out of my drives on both holes and, at my best count, scored an 8 on each. I hate this game. Hole 13: 118 yards, par 3. Lovely looping nine-iron, snug to the pin. Missed putt, par. I love this game. My right forearm feels ready to detach at the elbow, and beat me over the head. My nose is burning in the spot where I missed the sunscreen. 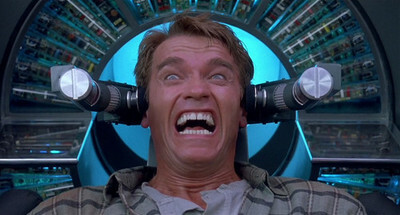 My stomach is empty, and noisily letting me know about it. Despite all of this, I still have 5 holes to go, and I’m determined to make the best of it. Once again, the 14th and 15th are both long drive holes, but this time I have a revelation: what if I use an iron, which have been pretty good to me today, from the tee. They’d be shorter hits, but they might be straighter, and maybe I can score a respectable 5 instead of a disgusting 8. So, out comes the three-iron, and I swing a mighty swing. Topped the ball, it rolls 20 feet and dies. WHAT THE FU-? HOW THE-?! Whatever, I’m so exhausted and frustrated, I just want to go home and go to sleep. But not… until I finish… the course! On the 15th, I hit a decent drive, probably about 200 yards, at the most. It only sliced about 50 degrees to the right, as opposed to the usual sharp 90 degree turn. Hey, there’s progress. I manage a 6, give myself a mental high-five, and move on. Water? What’s this? Why is there water in this game? Why, when you’re at your most tired and most discouraged, is water just splashed in front of you, acting as a barrier between you and your goal? Whoever invented this game is insane. I only lose 3 balls making my way through the swampy 16th. So, I’ll just stroll up to the 17th and – WATER! A LAKE! A VERITABLE OCEAN!! RIGHT IN THE MIDDLE!!! Golfers on the other side of the course can probably feel my rage boiling at this point. Not only is there a sizable water hazard down the centre, but also a smaller one on the right, right in my natural slice path. Swing, tock! splash!. Swing, tock!, splash!. I’ll spare you the details, just know that I was ready to pull a Mikhail Youzhny with my driver. AND THERE’S STILL ONE HOLE LEFT!! AARRRGGGHHH!!! The 18th hole is a straightforward 300 yarder, dog leg right. Hey, this could end well, I somehow thought to myself. The next song on my playlist will serve as my oracle: “Don’t Worry Be Happy” YES!! Approaching the tee, I had a thought. Shift your feet to aim to the left, then when the inevitable slice happens, you’ll be dead centre. I try it, it works! I’m on the fairway after a drive – just one drive! My second shot is a decent approach, just off the green, about 30 yards from the pin. 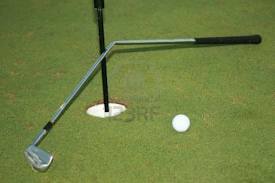 I chip to about 10 feet, line up the putt… it goes in! A par to finish up my day feels like winning the Masters. I do the Tiger Woods fist-pump as I collect my ball, and practically skip back towards the clubhouse. So, one man, 18 holes and my iPod. What did I learn? I suppose one thing is that in 18 holes, you have the opportunity to try a variety of strategies, some that come from professionals, some that you make up on the spot. There will be bad times, and good times, times of great distress, and times of tremendous confidence. You need some skill, some luck, and a lot of analysis to make it through safely. But having some music helps, and I’m sure that with some friends, some beers, and some good conversation, it would have been great. Hey, that kinda sounds like an analogy for life. I wonder if any writer has ever made that connection before.